This exercise increases the abdominal strength necessary to keep the pelvis stabile while flexing the hip. 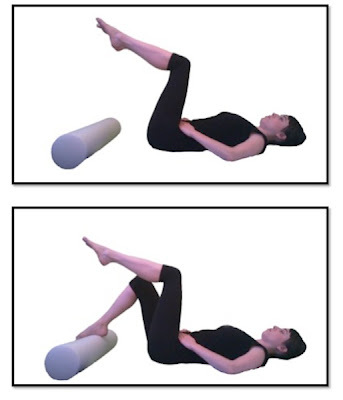 The aid of the foam roller lessens the range of motion while strength is built. This exercise requires abdominal support to keep the pelvis connected to the ground while moving the leg in the hip socket. On each exhale remember the pelvic floor and lower abdominals which will keep this movement out of your back. Exhale and imagine your spine lengthening as your reach the toe to the log.